You'll treasure and enjoy giving this new holiday gift book from Lucinda Cockrell with music by Butch Baldassari, the result a combining of the sights and sounds of Christmas past. 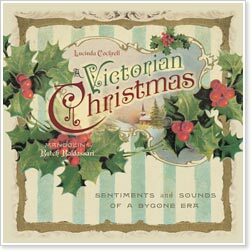 With foil, embossing, and a rich, saturated four-color interior full of classic Victorian images, A Victorian Christmas is heart-warming holiday gift. It's filled with artwork and inscriptions from postcards and Christmas cards, poems and prose from the early twentieth century. The accompanying CD add soft, beautiful Christmas songs performed by acclaimed mandolinist Butch Baldassari. The result is an experience of Christmas from a bygone era, a unique way to say "Merry Christmas" to a loved one - or to yourself!